This is what happens when a famous cook asks people for food advice. Twitter is not be the best place to seek answers to questions about nutrition, but that didn't stop cookbook author and model Chrissy Teigen from asking for guidance from her millions of followers. On Saturday, Teigen asked her Twitter fans to tell her which fast food meal they thought was the healthiest. Oh boy, did they ever tell her what they thought — and their responses are pretty hilarious. Teigen's cookbooks "Cravings: Recipes for All the Food You Want to Eat" and "Cravings: Hungry for More," may be filled with over-the-top decadent recipes, but she's interested in healthier foods, too. "What do you think is the healthiest meal (not side) of any normally junky fast food chain?" she wrote in her tweet. She didn't specify if she wanted to know the most nutritious breakfast items or how to cut calories on a drive-thru burger splurge. There's a lot of info out there about the healthiest fast food options from reliable sources, like TODAY Food and Consumer Reports, but Teigen seemed more interested in understanding which foods the public perceives as healthy. Needless to say, she got a lot of suggestions and sparked a food debate among her slew of Twitter followers. One tweeter swore by Subway — and Subway agreed, of course. Others put in a good word for Wendy's, but debated whether the chain's healthiest dish is its chili or salad. Chili. Baked potato. Grilled cheese. 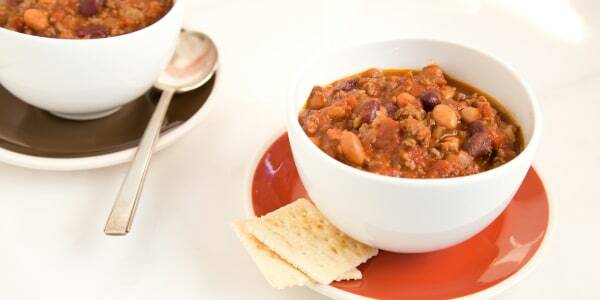 Because who doesn't love some hearty chili? Also, she made it clear that she did not want to hear about salads. Even though she told her fans, "no joke answers please this is serious," in her initial tweet, a lot of people just couldn't help being silly. Another suggested water that was spiked with booze. Is that on the Dollar Menu? It wasn't long before the comments began to spiral out of control, just like they did with Teigen and her husband John Legend's debate about what "simmering" means. Eventually, Teigen put a stop to the madness. Perhaps she finally realized that Twitter is not the best source for answers to nutrition questions.